Luxury at affordable prices! That's the hook for a new complex at 702 Ocean Pkwy (technically Parkville not Kensington). Here's the NY Times listing and the website for Parkville Promenade Condo's . 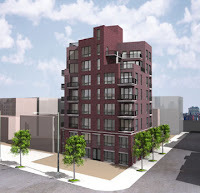 If you check the 'Prices & Floorplans' seems 8 out of the 15 units are already sold and a storage unit is a cool $7,500. And in case you didn't know "Ocean Parkway address for Brooklynites is comparable to a Madison Avenue address for Manhattanites".